This second segment covers clever deceptions and bold exaggerations by Noreen Renier about finding the crashed airplane ---claims she repeats even in early 2019. Even after Noreen Renier's falsehoods were publicly announced in 2006 she's kept retelling and expanding the same deceptions. It's clear Noreen Renier craves public attention and will say anything and post anything --- she admited in court to providing reporters with information she knew was wrong and pushing exaggerations. As a United States federal judge ruled, Noreen Renier is not credible and misled a federal court while under oath. Here we showcase further proof of her 34 year old plane crash charade. Massachusetts realtor Jessica Herbert had hired psychic Noreen Renier in February 1984 to locate the plane because Arthur Herbert (Jessica's brother) was missing and was assumed aboard the plane. After taking the case (for payment), Renier indicated to Jessica Herbert that Arthur had boarded the plane and yet had left the plane after the crash in search of help. These facts are detailed in testimony made in an Oregon court in 1986 and also in Renier's 2005 edition of her book A Mind For Murder. Yet the National Transportation Safety Board determined that all missing person airplane occupants, including Arthur Herbert, had "died immediately" upon impact. How could have Arthur Herbert walked for help if he was dead? And had Jessica Herbert helped to Noreen Renier create a fantasy before a jury to win the case against her critic while setting up her dead brother as a hero? John Merrell began to investigate these kind of conflicts in TV psychic detective Noreen Renier's claims after receiving a letter from an Oregon woman named Nancy Uzdavinis who sought out Merrell for information about Renier. But in 1985 Renier's Oregon attorney, Lee Werdell, of Medford, in the Medford Mail Tribune (November 5, 1985 issue), stated, "I intend to prove she is real and what they say is a pack of lies, done out of personal pique by a man [Merrell] who has made no competent investigation of my client's history or background." The county courtroom case went to trial in 1986. In A Mind For Murder psychic detective Noreen Renier has falsely attached herself as an instrument of awe in finding the crashed plane. She refers to the excitement of aerial searching and the wonder of "becoming the plane" as it flew above the Massachusetts terrain. Yet Carl and Cheryl Wilber are the two people whom local Gardner-area newspapers credited with finding the plane. Noreen Renier was never mentioned. And it was not the first plane crash the Wilbers have discovered. 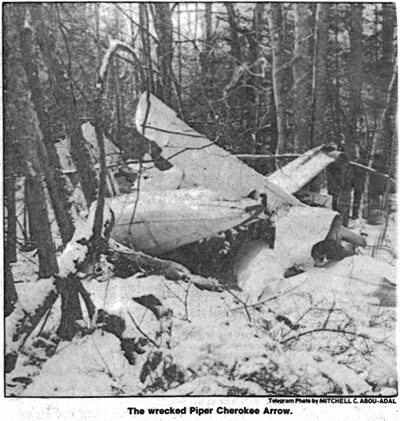 Two years prior to the crashed plane that carried Arthur Herbert, the Wilbers located one of two planes that crashed near the same area after colliding over the airport. Professional and straightforward, the Wilbers, as well as the other searchers, according to Renier "couldn't help but notice the planes that had been circling overhead" and literally stumbled about at the crash site. According to Renier during her March 1, 2015 interview the Coast to Coast AM broadcast, the Wilbers were guided to the crash site by the previous circling planes, which were in turn guided there by the numbers (latitude and longitude) that Renier claimed she provided. But its all simply exaggerated nonsense to attract media attention by Mrs. Renier. In his deposition read to the jury in 1986, FBI agent Mark Babyak (the ex-husband of Jessica Herbert) stated, "Well, my understanding of what happened after we left is that the following day a resident of that area and his daughter, due to our circling over that area constantly, went out in that area themselves and they found it." Since this matches Renier's statement, did FBI agent Babyak get this "understanding" from Renier --- whom his ex-wife had hired to help locate the plane? Mrs. Renier herself also references the "from planes circling" connection in her 2006 presentation videotaped in Las Vegas. "Well, it's not true anyway," said Cheryl Wilber, who doesn't recall seeing any planes at any time over the previous 10 days circling the area --- which would likely have included their house! Even if a plane circled the area of the crash site, the first 2000 feet (610 meters) at the southern end of the runway was a flat open and average 3 foot to 8 foot deep swamp (1 to 2.5 meters). There would have been no need to circle the area above the crash site time and time again. Carl Wilber said they used only his hand compass to follow the last known direction of the aircraft as reported by the two witnesses at the airport who saw the plane and heard the crash. Renier does not spend time in either edition of A Mind for Murder mentioning the ground search or ground rescue squads who endured sub-freezing temperatures and frozen swamps the week before the plane was found and weather improved. A newspaper report at the time (and provided to the Oregon jury and shown on this web site) noted that "ground searchers were hampered by snow over a foot deep in some areas. Some searchers walking in the snow fell into water up to their chests as they combed the wooded and swampy areas southwest of the airport." Missing person psychic Noreen Renier doesn't mention the Explorer Scouts, church and community search personnel, or the assistance from either of the two local police stations for the cities of Gardner and Templeton. Instead, Renier presents herself as a strong and critical presence at the scene. Renier writes, "I was still hovering over the scene. . . . I looked calmly at the two dead men in the front seat of the crashed plane. . . . I described the two men sitting in the front seats, and the pretty young woman who sat in the back of the small plane with Jessica's brother." Yet she told the Oregon jury in 1986 that "when they found the site and the people, there was a woman placed under a tree." And she made the same claim during her broadcast interview on March 1, 2015. As there was only one female passenger --- Carolyn E. Porter ---- which story is right? Miss Porter seated in the back of the plane or seated under the tree? On March 1, 2015 Renier makes that clear by indicating that Miss Porter who had sat in the back of the plane (as she falsely indicates in her book) was carried out of the plane by Arthur Herbert. While over the past 30 years Renier has said Miss Porter was alive and carried out, on March 1, 2015 she said she was carried out headless. Of course this is confusing as the search team and medical examiner found Carolyn Porter completely encapsulated inside the crumbled plane ---and not in the back seat as stated by Noreen Renier--- but the front seat where they determined she died instantly. Thus if Noreen Renier is accurate and truthful Arthur Herbert apparently came alive after dying (since the medical examiner indicated he died instantly), and, based on Mrs. Renier's claims then set about extracting Miss Porter from the back seat. This would have been virtually impossible as there was little left of the rear of then plane. Yet, based on Mrs. Renier's claims, after extracting Miss Porter he then either gently sat her down still alive under a tree before she died, or sat her her down headless. This depends on which of the two different claim versions by Mrs. Renier you wish to believe. Then after first putting her under the tree he would have had to carry Miss Porter back into the plane to the front seat and proceed to crumple the plane with such force that he encapsulated her in the fuselage as it was found. Indeed the search and rescue personnel had to cut away portions of the plane to extract Miss Porter's body. After doing this and before walking some distance away from the plane (where his body was found apparently tossed from the aircraft upon impact), he then collapsed and died. Or in another version Mrs.Renier presented in Las Vegas, he proceeded to walk down the hill in an attempt to get help. But according to Mrs. Renier he failed to reach help as he had a broken leg and died from his injuries. This walking down the hill presents a further set of problems however as he would have had to first swim across a partially frozen swamp since the small hill was several thousand feet away and first went up, not down. And afterward he would have had to swim back over the partially frozen swamp and die (as he was found) close to the airplane. Or is it more likely Noreen Renier is a compulsive liar and has changed and so compunded her bogus stories that you find nothing but strings of delusions? The reality is that all of the claims by 'TV police psychic detective' Noreen Jean Renier are bogus. While the pilot was dead in his seat, directly at his side was 26-year-old Carolyn Porter, sitting beside him in the front, not in the back of the plane as indicated by Renier. There were in fact no passengers found sitting in the back of the plane. Nor was Carolyn Porter found sitting under a tree as Noreen Renier has claimed in her books and also described before millions in the 1990's on the Joan Rivers show. Nor were the conditions found at the crash scene what Noreen Renier described during her filmed Las Vegas presentation in 2006, or as she states during her interview on March 1, 2015. Just ever evolving delusions. In a transcript posted from Court TV On-Line (which became truTV On-Line) psychic Mrs. Renier states "I even found a missing airplane for an FBI agent's wife a long time ago... ...I could see it being swallowed up by trees. The two men in the front seat, their necks were broken." But like her claim that Carolyn Porter was found outside the plane after being carried out, Mrs. Renier is wrong about the men in the front seat. Other than the pilot the other male passenger Renier refers to as sitting up front in the plane --- Robert Brewster --- was actually found approximately 50 feet from the plane amid the 150 foot pathway of snow-covered plane debris. Real people and real deaths --- but used by a psychic who assumed no one would ever check on the accuracy of her comments. In A Mind for Murder, Noreen Renier ends her chapter called "The Doomed Flight" with, "They found the body of Jessica's brother [the third male passenger] a few yards away, sitting on the side of a hill, his leg broken, a torn piece of his sweatshirt hanging from a tree branch above him." Like in her March 1, 2015 interview in her 2006 Las Vegas area appearance Mrs. Renier claimed that Jessica's brother Arthur clearly had walked around --- and carried Carolyn Porter outside the plane --- because Arthur Herbert "walked several yards" before he died "because the police could tell [this] because there was stuff stuck on his pant leg." But neither of the police agencies with jurisdication ever made this statement as both relied on the official medical examiner and NTSB examainers --- who all concluded Arthur Herbert died instantly. In A Mind For Murder she adds "It was clear to everyone that he had been alive when he left the plane." The words "everyone" and "alive" are pretty impressive statements if you don't know the facts or that Mrs. Renier simply makes up claims and connects them as being told to her by police, witnesses, or the ghosts of the dead whom she communicates with. And although finding Arthur Herbert's body "several yards" away from the plane is how Renier described the scene in Las Vegas, the real location of Herbert was approximately 50-60 feet from the plane, according to Carl Wilber, and in a scene significantly different. Arthur Herbert was found on flat ground (not a hill), his body frozen to the ground and flat on his back (not sitting), with one fully clothed arm extending upright grasping a tree branch that was bent over from more than 6 feet above where he lay. Cheryl Wilber, who along with her father Carl found the crash scene, believes it is possible that Herbert had jumped out of the plane, since the its entire rear seating area was completely compressed into a tightly sealed mass. If he jumped, he may have attempted to grasp tree branches as he fell. But whether he jumped or was thrown, it is certain (according to the medical examiner) that he died instantly --- contrary to Mrs. Renier's "psychic" vision. Cheryl Wilber notes, "They [Arthur Herbert and Robert B. Brewster who was found approximately 50 feet away from Herbert] were trying not to get killed --- [Arthur jumped] --- that's what I think I would have done. . . . There was no way he could have gotten out of the plane [once it hit ground]." Jumping however is unlikely as it was a dark night and the plane unexpectedly sliced into trees just seconds after flying over the runway at just 18-20 meters (about 60 feet) off the ground. As to Mrs. Renier telling Jessica Herbert (and others) that her brother had carried a companion outside of the wreckage and sat her under a tree, Cheryl Wilber notes any attempt by Arthur Herbert to remove Carolyn Porter's body from the plane is sheer fantasy. "Nobody could have, even if they'd tried to." After substantial efforts to get the proper equipment into the area, the remaining hulk of the plane had to be cut open with hydraulic cutters to remove Carolyn Porter's body. The crushed cabin of the plane completely sealed her inside. Arthur Herbert never carried Carolyn Porter anywhere, nor sat her gently under a tree. Nor did he sit on a hillside a few yards from the plane before dying. 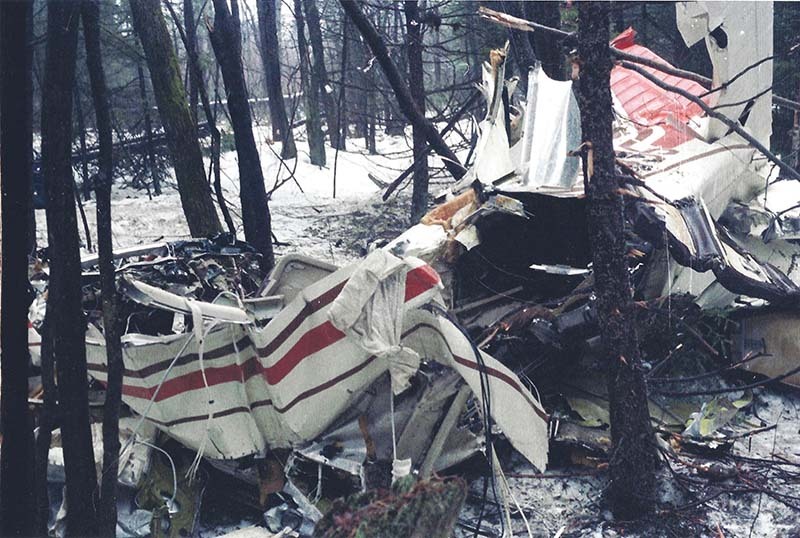 Passengers Arthur Herbert, Carolyn Porter, Robert Brewster, and pilot Charles Principe all died instantly on January 28, 1984 according to the medical examiner. Yet Dale Graff, cited as an author and researcher at Psi Seminars Initiatives (PSI), wrote that the book by Renier "is a tremendous contribution toward the acceptance of the practical nature of PSI." And Pamela Heath, author of the PK Zone, adds support for Mrs. Renier's talent. In her review of A Mind for Murder Health writes, "This is one woman whose gift is genuine. . . . I've read a number of autobiographical accounts by psychics over the years. This is the best of them." Carl Wilber, who found the plane, flatly stated, "She [Noreen Renier] hasn't a clue what happened, and how she can go out and say all those things [about finding a plane] when she wasn't even there. . . . She's making money on this and including my name . . . and I don't like people lying." In her book A Mind for Murder Mrs. Renier writes, "At the time, Jessica [Herbert] could not confirm my information because she had never met the other passengers. It turned out later, however, that my descriptions were accurate." Noreen Renier told the courtroom under oath in 1986 that John Merrell made her feel "strange" when he questioned her on the phone in 1985 about her involvement with finding the lost plane. Yet Noreen looked directly at the jury and stated, "I told John, when they found the site and the people, there was a woman placed under a tree. . . . The woman's brother had walked several feet and died, but they found everything that I described." Yet Cheryl Wilber notes "Noreen Renier had the wrong people in the wrong places and doesn't have a clue." Cheryl who was at her father's side when they found the plane says Noreen Renier is absolutely wrong in her descriptions. "Nobody could have possibly walked. . . . The way the plane landed there was no way you could have got out of the plane. . . . The back of the plane was squished. . . . Nobody could get out of the plane. [Arthur] Herbert and [Robert Brewster] saw it coming and knew it was going to happen and either were tossed out or said, 'Hey, I'm going to take my chances and jump out.' . . . There wasn't enough damage to the trees to grab the plane so it went down fast." "Perhaps," said Merrell in early 2011, "the only thing that would have convinced a jury this was a fantasy would have been to show photos of Carolyn Porter's body sealed within the plane and being extracted with hydraulic cutters. They apparently ate up Renier's every word as the absolute truth. Two of the six jury members even began crying. They probably thought no one would ever create a whopping story like that under oath in a courtroom unless it was true." Gardner Police Detective Lieutenant Gerald Poirier has noted that the crash site is "essentially in Wilber's backyard" with their home just over a mile away. And Poirier, who was on duty the evening of the crash, also doesn't recall any toothless woman as described by Renier. He also doesn't know of an old abandoned combination gas station and dry goods store at the bottom of a winding road down the mountainside near the crash site (all descriptions used by Renier in her book titled A Mind For Murder. In 2006 before her live Las Vegas audience "super psychic" Noreen Renier enhanced her make-believe visions further. She claimed that it was search members on the ground that found the gas station "and the dogs came out on them!" Yet on March 1, 2015 her local search members have now suddenly have become "off duty" F.B.I. agents according to interview on Coast to Coast AM. But as there was no gas station and no dogs, its yet another series of lies among the dozens created by Noreen Renier. Lies built ever higher on lies. Merrell goes further: "I walked the surrounding crash area extensively. One cannot walk 'down the mountainside' to a nearby abandoned gas station by the crash site. The immediate crash area is virtually dead flat, with the swamp very close at hand." In videotapes of her Las Vegas appearance Renier described the moments before the crash in her vision ---"All of a sudden a mountain is there, and I'm not at the top, I'm in the middle" near a "yellow dirt road like a ribbon going up the mountain" by "an old rusty Gulf gas station [where] this old lady came out." A passage by Renier from A Mind for Murder says, "When you reach the gas station, take the dirt road up the mountain." Upon reading that, Cheryl Wilber immediately cried out, "Ohhhhhhh come on now" and Carl Wilber sighed and said, "There's no mountain for miles. There's not even a sudden 15-foot incline for thousands of feet. It's flat by the swamp." No middle, bottom or top section of a mountain because there is no mountain. The closest significant mountain (Wachusett Mountain) is more than seven miles from the crash site and almost eight miles from the Gardner airport. No toothless woman. No abandoned gas station. No mountain. No hill. No passengers in the back seat. No dry goods store. No psychic detective on site. No FBI agents verifying Mrs. Renier's every word. And no hunting dogs. And most important, absolutely no people wandering around alive. In 2006 "super psychic" Noreen Renier claimed that the "yellow dirt road like a ribbon going up the mountain" existed. Presumably after her 2015 revisions do her supporters also believe the plane was found on Dorothy's yellow brick road on the way to the Wonderful Land of Oz? In her book, Renier cites rocks below, big gorges, and hills and mountains. She claims an exhilarating feeling as she becomes the plane as it soars above the crash area. Clearly, however, the plane did not crash into a hill. It clipped treetops due to its extremely low altitude and then dropped beneath the trees. 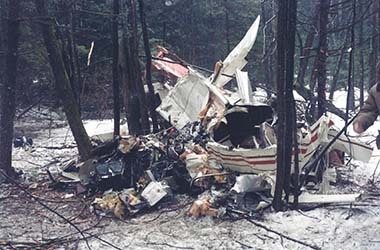 Yet Renier's use of the words "sucked down" are faulty, particularly since the National Transportation Safety Board said poor lighting conditions, improper use of equipment and collision with trees contributed to the crash. They also found electrical switches in the off position --- including lights. But once again Jessica Herbert, a realtor, testified haphazardly in the 1986 Oregon case and actually backed Noreen Renier's fantasy claims. Jessica Herbert stated that Renier said the crash area was "very rocky and there was quicksand around the area, big gorges, in fact this hill that they actually crashed into. . .she mentioned also that there was a down draft that had sucked the plane down, she could feel the. . . well, in fact, this down draft caused by the hill being there, the way the air current flowed off the runway and. . . it had caught in a down draft. That's exactly what happened." But Jessica Herbert's testimony supporting Renier is a bold and untrue fabrication. In their official report the NTSB has no references to the plane hitting a mountain or a hill. Just as there are no references that the crash was caused by a downdraft. But Massachusetts realtor Jessica Herbert and Noreen Renier made the perfect support pair for a bogus charade before the jury. One reader noted on Renier's web site in early June 2006 --- a posting that seems to come and go --- that "Noreen Renier is very talented, and she's excellent at what she does. . . . As I read it, I could imagine and picture in my mind everything she wrote about, the stories she told, the things that happened to her; it was all so clear to me how and why she became what she is today. Noreen is the most experienced, most credible psychic I know, and she's the greatest! . . . No one and nothing else out there could ever come close to being anything like Noreen Renier!" But Cheryl Wilber and her father Carl know firsthand the events described in the book by Noreen Renier and Naomi Lucks are very different from the truth. Standing in snowfall and in subfreezing temperatures, these two people stood in frozen silence and looked at the four bodies around them. "They appeared like frozen white mannequins," said Cheryl, who was eighteen at the time. "I wasn't afraid because the scene was so calm. . . . And what the psychic saw in her mind was not what we found. Not at all." According to Renier in A Mind for Murder, "Cheryl actually tripped over the body of Arthur Herbert." When Cheryl read that sentence from the book in early June 2006, her face became angry for a moment and then she shook her head in frustration saying "That never happened. . . . We were 75 to 100 feet from the plane when we first spotted it. . . . My father told me to be real careful as we approached, so we took it slow. . . . We approached it with the plane lengthwise in front of us with the tail of the plane on our left. . . . Since the crash area was so flat we weren't hampered by anything. . . . Everything was undisturbed. . . . It was cold but the only evidence of any life were the deer tracks in the snow. It was the curiosity of the deer than led us to the plane. Each of the bodies was easily located and we never disturbed them." Cheryl Wilber looked shocked as she read in Renier's book that she and her father "chose an appropriate vehicle for the winter search: a snowmobile, which allowed them to explore the woods unhindered." Cheryl exclaimed "A snowmobile! That's so incredible! Where did she come up with that?" Carl Wilber noted that the State Police were able to reach the crash site with a 6-wheel all-terrain vehicle, and a snowmobile with effort might have reached the site --- but they never saw one. More importantly, the Wilbers themselves have never owned or used a snowmobile. However three days before the airplane was found by Carl and Cheryl Wilber psychic Noreen Renier provided a confusing collection of visions to Jessica Herbert about the location of the crash site. Is it a coincidence that the Gardner News reported on the same day that "several Templeton officers are working with people on snowmobiles to search for the lost plane." 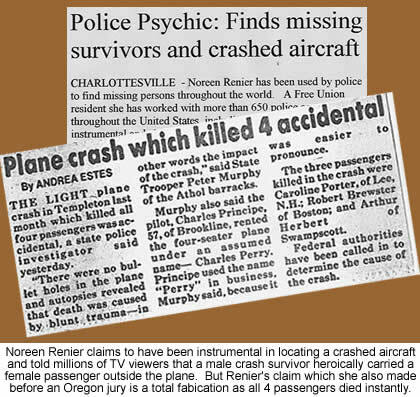 Is this evidence that Noreen Renier collected her "psychic information" from newspaper stories carried about the search and then once again used the same news clippings to impress her book readers? What purpose does it serve for Renier to trivialize the efforts of the real people who actually made the discovery and hiked through a frozen wilderness and swamp area while she created a fantasy for her readers and millions of television viewers? Among dozens of people contacted in the search area who recalled the plane crash or were directly involved with the search none had ever heard of a psychic connected with the case until more than 20 years after the crash! Even the female pilot who witnessed the crash --- Cricket Frost --- did not know about Noreen Renier's claims until December 2007. Four people were actually killed and instead a fantasy was created by police psychic Noreen Renier around the deaths of those people. Jessica Herbert's brother Arthur Herbert did not heroically remove Carolyn Porter from the plane and then carry her in his arms. Yet Noreen Renier has continued to get extensive television and media coverage. Television and media producers generally do not take the time to substantiate paranormal claims --- they compound their profits by producing rapidly and avoiding scrutiny of the accuracy of the claims. The psychic business is estimated to bring in nearly $4.5 billion dollars yearly just in the United States and many are doing their best to avoid reducing this pot of paranormal gold. But U.S. police agencies hiring or using psychics (either as paid consultants or sanctioned investigators) declined by more than 97% between 2005 and 2010, and by late 2014 all United States law enforcement agencies have ceased using psychics in any manner. The few who previously worked with psychics hired by families on missing person cases are now encouraging family members not to solicit or hire psychics. On a Court TV web site, Robyn Hunt, the series producer of Psychic Detectives (a television series that has highlighted Noreen Renier in a dozen episodes), stated during a September 30, 2005 interview --- the same date Merrell's attorney informed Renier of a possible lawsuit by letter --- that, "We find psychics based on the cases the police department has solved, so it wouldn't be up to us to determine whether they are real or not. In a particular case, they seem to have been helpful -- and that's the way we determine if they're credible or not." Is it proper for huge corporate media production companies to excuse themselves from determining whether the person they portray on network television as a "psychic" might in fact be otherwise? Robyn Hunt, the Court TV series producer of Psychic Detectives, seems to leave that determination up to police --- tossing the burden of proof to them. Robert Ressler, the former director of the FBI's Violent Criminal Apprehension Program, has been an avid fan and the leading media supporter of psychic Noreen Renier. The strong bond between Robert Ressler and Noreen Renier began more than 30 years ago and Ressler remains Renier's most prominent law enforcement supporter. Ressler was interviewed by Lisa Provence in an article dated February 3, 2005 and mentions that he has referred "dozens" of law enforcement officers to Renier. He is the same retired officer who has stated that Renier helped find the crashed plane. As for Renier's psychic abilities, Ressler noted that Court TV checks out people very carefully. "The fact that Court TV is backing her is proof she's legitimate." Are the psychics TV production companies broadcast the careful proof of legitimacy sought by Ressler --- the same man who recommended Renier to dozens of police agencies and had her lecture at the FBI Training Academy? If so, his judgment for psychic proof was extremely weak. It seems that Court TV based much of their beliefs upon the opinions of law enforcement personnel like Robert Ressler, who in turn place a banner of legitimacy at the foot of Court TV. Next we examine how Noreen Renier continues to attract media using her story about finding the lost airplane. Please advance to Part 3.